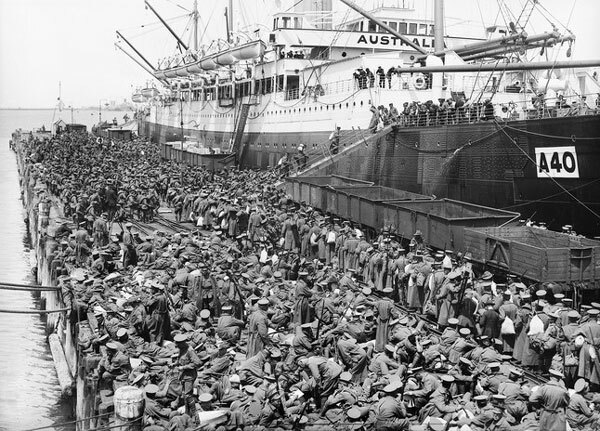 The Western Australians have come aboard, we are very crowded – 1700 men on board. We are anchored two miles off the shore. Yachts and launches have been running trips, around the boats. We heaved anchor about 4 a.m. Monday November 3rd. There were four boats when we left Fremantle. 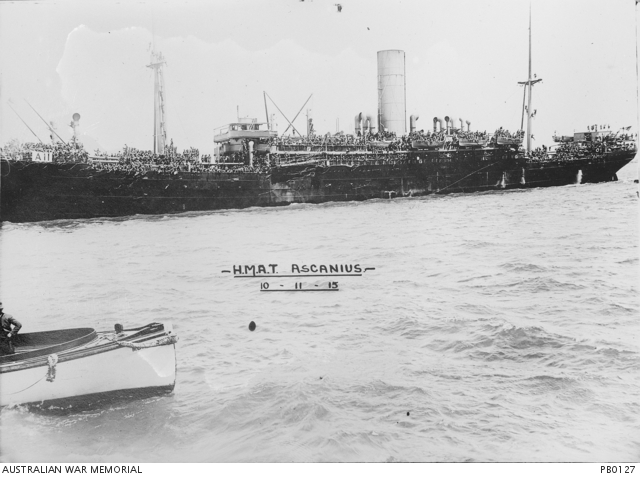 A Japanese Cruiser, A British Cruiser, the “Medic” and the “Ascanius”. The Jap was travelling about ten miles ahead, the “Medic” about one mile in front of us, and the British Cruiser five miles directly to Starboard. We struck it fairly rocky when we got out a bit, and several W.A. men fell victims to sea-sickness. At sunset on Monday our engines were slowed down until we only had enough way on to keep our head to the sea, also all lights were doused. The binnacle light had a hood over it and the officers pasted brown paper over our port holes. About 3 p.m. yesterday we had a little excitement, smoke was seen well out to starboard, and later it was noticed to be a big cruiser. One of our escorts went to investigate. It appeared to us that the stranger put on pace and passed our boat – then the Jap turned and chased over, and our engines were stopped. Of course we all thought we were in for a scrap. Later on we saw ship after ship coming up on the horizon, and then we knew we had caught the fleet. It was an inspiring sight. There were three big lines of boats, each thirteen deep, stretching over about nine mile, and about two miles wide. Around the lot of us is a cordon of warships. We have been inoculated against Enteric and Typhoid. An injection is made in the fore-arm, after it has been pained with iodine. It has a very nasty effect – the arm gets stiff and pains, and a feeling of nausea is experienced. A good deal of crockery has been broken the last day or two through sliding off the table. You put your tea on the table and look up for a moment, and it is gone. The plates have races from one end of the table to the other. Our kangaroo has been seasick the last day or two. He has been lying wrapped up in a hammock, and takes to it like a human being. He has a little pillow and looks very cute. The days are becoming much warmer now. We cover 240 miles per day. This afternoon we had life belt exercise. We had to fall in at our messes and put on the belts, and close all portholes. Today we are having a boat race in the ships boats. E & F Company v G & H.
Today we had an eight mile march to the rifle ranges. We have taken in a lot of ammunition, that hardly looks as if we were going to England. There are quite a number of British and Japanese war boats coming and going while we are here. Instead of sleeping below last night, I slung my hammock about seven feet above the deck, and swung in the breeze. Today was “eight hours day” here, and the river was alive with boats. I saw what is termed a fisherman’s parade. A motor boat towing six dinghies full of men going fishing for the day. We are at Fremantle and the Pilot has just come aboard. I am on duty at the wireless room, the Captain told me that a wireless station had been discovered, and that I was to shoot anyone who did not stop when challenged. 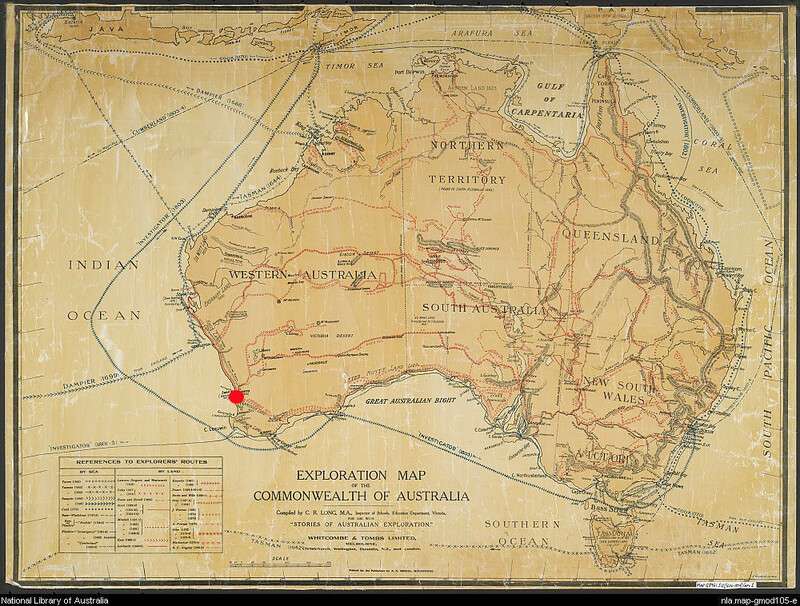 I heard that we were escorted by four Cruisers from Port Adelaide to Albany, and from thence eight – although we did not see them. Men are loading Ammunition Wagons, stores etc. Land was sighted early this morning, and after I had had my morning hosing I got the glasses to bear on it. The coast is hilly, something like our hills, and there was a peak like Mount Lofty. The “Medic” is cutting in between the shore and ourselves. She is bound for Albany. The “Ceramic” passed us yesterday; she is a lovely boat and the biggest south of the line. A boat on the horizon causes great excitement. When the edict went forth that every man was to have his hair close clipped, some tried to evade having it done, and some amusing scenes were witnessed. You would see a fugitive rushing from one side of the boat to the other, with a stream of yelling heathens at his heels – he is caught, thrown on the deck and the clippers run through his hair and his head resembles a field through which a reaper has passed. He has to seek the barber to complete the job. I went through the engine room and was surprised to find it quite cool, owing to the splendid system of ventilation. Yesterday we had fire drill. The alarm bell rang and we had to all fall in at our messes and keep strict silence while the crew practiced. We rose at 5am, struck camp, and packed everything up, and by 9 o’clock, we were on the move for the station. We all had to carry both our kit bags, overcoats, and rifles. 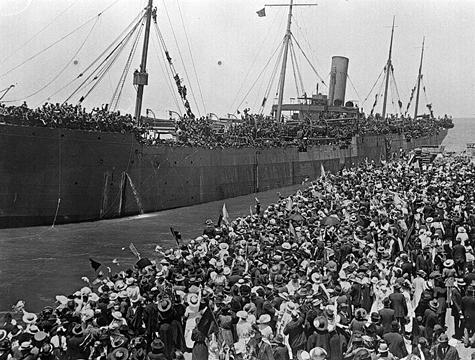 All along the line we got a splendid reception, and at Port Adelaide all the lumpers lined up in the street, and nearly cracked the carriage windows with their cheering. At Glanville all the school children were lined up with their band playing, and all the girls were in white, all waving red, white and blue flags. It looked very nice I can tell you. At the Outer Harbour we were appointed to our places and then allowed ashore to have lunch and then I saw you. It was just the thing you all coming down. The land gradually opened up, we could see all the towns on the coast at once, the houses assumed the shape of straight lines, became blurred and finally blotted out. It was beautiful on the fore-deck towards evening. The sea was very smooth and the bows threw up a fine big wash, out of which a porpoise dashed occasionally. There is a dry canteen on board where we can buy biscuits, sweets, fruit etc., and a barbers shop stocks purses, shoes, underclothing, belts and almost everything one needs. Besides ten horses, there are two kangaroos and a dog on board, and I must not forget the ship’s cat. Our quarters were somewhat stuffy, and one unfortunate paid the penalty by being sick. It was rather fun getting to bed – fellows crawling into their hammocks in all ways. One or two fell out, they were very comfortable when you were once safely in. There was a roll on next morning, we were out in the ocean, having passed Troubridge Light on our Port and Conley Point on Starboard bows, about 9 o’clock. We fell in for parade on the boat deck for physical drill. One or two fellows weren’t feeling too happy, and before sunset, a fair number were ill. The food is very good. For breakfast, we get porridge with milk and sugar, coffee ditto, meat of all descriptions, bread, butter, jam, pickles. Dinner:- soup, stewed hare etc. Tea:- bread and jam. We prepare hammocks at 6pm, bed and “lights out” 9pm. I got up at 5.30 and had a hosing down from the men washing decks, the water is salt and is pumped through a big canvas hose, if it hits you in the face, it nearly knocks you down. My reason for doing this is that the showers are not turned on till 6 o’clock, the pressure is poor and the crowd is large. Breakfast is served at 7.15 and you are quite ready for it. Fell in at 11 o’clock for physical drill with running, jumping and wrestling, in the afternoon musketry exercise. By this time, the boat was rolling heavily, and it was rather funny to watch the fellows trying to stand up straight, a very fair number did not stand up at all, but were down and out for the time. Everyone has had their hair clipped as short as possible, we all look a lot of criminals.